The golden sun behind a silver cloud." 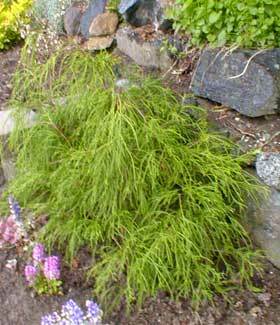 Chamaecyparis pisifera 'Sungold' is a dwarf golden threadleaf cultivar of Japanese sawara or false cypress. 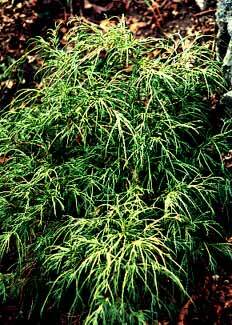 Its golden evergreen scale-like needles cling to weeping or semi-weeping branches. In summer it is very green, having good winter yellows if placed in a sunny location. New spring growth also emerges bright yellow. Golden leafed varieties such as 'Sungold' & 'Mops' do best with companion plants that provide windbreaks, as they are susceptible to windburn in winter. Some golden varieties are likewise prone to sunburn, although 'Sungold' per se is not overly sun-sensitive & has better color with a good deal of light. They do not like wet or poorly draining soils. They're somewhat drought tolerant once established, but will need moist well draining fertile soil for the first couple years to properly establish, & even then their drought tolerance shouldn't be too awfully tested during long rainless summers. Chamaecyparis pisifera in its natural form is an enormous tree of importance to the Japanese lumber industry. Its native range is in the southern mountains of Hondo Island all the way to central Kyushu. Dwarf cultivars have existed in Japan for centuries, & were first introduced into western gardens in the Netherlands & in New England in the early 1860s. Most of its many dwarf cultivars do not produce cones, but 'Sungold' when very mature might do so. With moderate pruning 'Sungold' can be restrained to about any small size required, but if left to go wild could very slowly but eventually reach eight feet of height, & considerably wider, with flattening top. With pruning (at extremely long intervals), it could be kept forever at four feet or smaller, but grows so slowly it may never need pruning at all. Either way, it will keep its shape even if allowed to grow to a ripe old age's eight feet. Ours, after only three years in the yard (in 2003, as shown in the second photo), was still only two feet by two feet tall, & by its fifth spring (2005, in the first photo above) it had gotten a bit wider but scarsely any taller.